Because of the popular use of our scale around the world, we are often asked how the Wong-Baker FACES® Pain Rating Scale was developed. It was created out of a need Donna Wong and I saw for children to be able to communicate about their pain so they could be effectively treated and supported. In 1981, shortly after completing graduate school, I began working as a child life specialist at Hillcrest Medical Center in Tulsa, Oklahoma. I worked with pediatric patients and their families to help them better cope with their illness or injury. Children often work through their fears and concerns through play and providing that environment was a profoundly rewarding experience. I used play, for instance, to learn what children understood about their experiences and to help give them a mastery over this new and often threatening environment. However, there were children in the burn unit and in pediatrics experiencing pain that was not being managed well. Those children couldn’t play. They could do very little besides focus on their pain. I also felt that on occasion, when the children complained of pain, they were not believed and therefore their pain was not given the needed attention. This became a growing concern to me. Around that time, Donna Wong, pediatric nurse consultant and one of the leading authors in pediatric nursing, became a consultant at our hospital. I am not a nurse and I had no idea who she was, but I did notice a change in the energy of the staff in the pediatric unit. People seemed excited and a bit anxious as they tidied up and prepared for this special visitor. Even then, she was quite the legend in nursing. That day, Donna and I began talking and I expressed my concern about the children in pain. This was also a concern of Donna’s. We agreed there needed to be a better way for children to let us know about their pain so they could get the relief they needed. We believed that with the proper tools, children could participate in assessing their pain, leading to more success in overall pain management. We began learning everything we could about pain assessment and management. 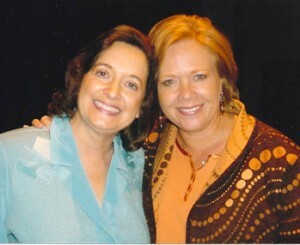 Donna was an excellent educator and I wanted to learn as much as I could from her. She poured information into me as her first mentee. Reviewing the literature, with the assistance of Peggy Cook, the hospital librarian, took considerable time. Remember this was the early 80s. Immediate access to information via computers and the Internet wouldn’t be happening for years. Donna and I found a few scales used with adults and some tools that had been developed for children, such as those using color, poker chips, and one unpublished paper that had used four different faces. Adapting a few of the adult scales and using the existing pediatric tools, we began introducing the assessment tools to patients. Young children had considerable difficulty using any scale with a number concept, ranking items such as cylinders with varying amounts of liquid in them, or any tools with unfamiliar words. Some children did not know colors well enough to create their own color scale and often had biases for various colors. When they did create a color scale, the color choices were not consistent with their peers, making the use of color difficult to replicate on a larger scale. However, the children responded well to the facial expressions, so we considered using a series of faces, with numbers assigned to each face to put a number to the pain assessment. We began giving school-aged patients paper with six empty circles in a line. The children were asked to think back to their own experiences and draw facial expressions to show how they had felt when they experienced different levels of pain. The faces initially received numeric ratings from 0-5, with 0 for no pain and 1 to 5 for increasing intensities of pain. We determined that the rating would not be sensitive enough with too few faces and would be confusing to have too many choices. Six choices were consistent with other scales used, which facilitated statistical comparison among the scales. At this point a research project was developing. I remember smugly telling my professor in graduate school that I would never do research, and here I was embarking on what would be six years of research. I should have paid closer attention in school! Children from the burn unit and the general pediatric unit helped with our project of finding a way for children to better assess their pain. 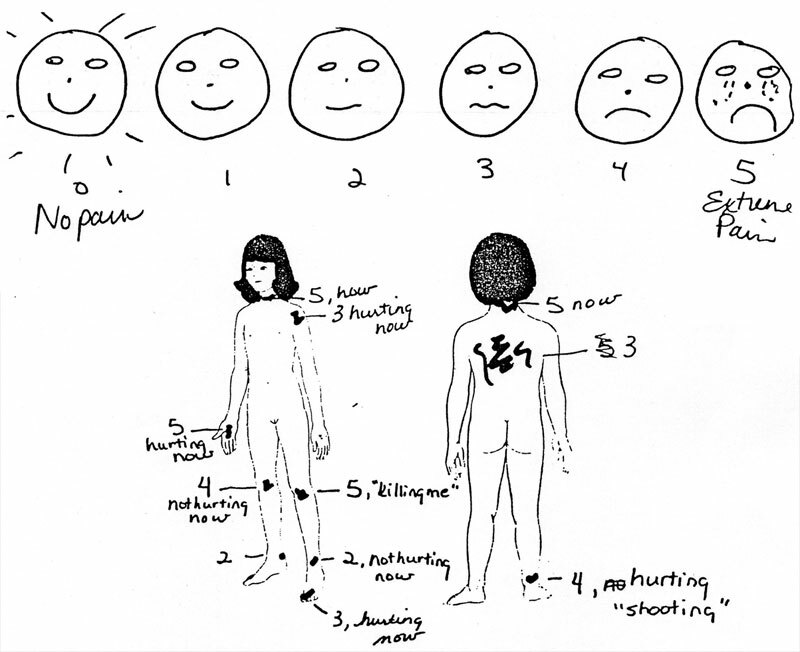 The children readily participated and often created elaborate faces and hairstyles to demonstrate the gradation from “no pain” to “worst pain they could ever imagine.” Although many children drew the sequence of no pain to worst pain faces from left to right, some drew the sequence from right to left. The left-to-right format was chosen because it is consistent with other scales and with English reading. Over 50 children participated in the pilot work. Each child’s series of faces was unique, but a pattern soon developed in terms of the shape of the eyes, nose, and mouth. A composite of the most frequently drawn features became a part of a pilot introduction with a new group of over 50 children to evaluate their ability to use the faces. The preliminary results were very favorable. Donna Wong asked a professional artist to use that composite of faces as a guide and he drew the final version currently used. The only additional, adult-determined detail was more differentiation to the eyes and eyebrows. The majority of the “worst pain” faces drawn by children included tears; even though many of these hospitalized patients did not cry when undergoing painful procedures, such as burn dressing changes. I asked the children about the tears, and they adamantly explained tears were important because “you could feel this bad inside.” We kept the tears in the scale, but we do specify in the instructions that you do not have to have tears to be feeling the worst pain. Some have questioned having a smiling face in the face depicting no pain, arguing the face should be more neutral. A smiling face was what the children drew and, as with the tears, we followed their lead. We wanted to stay as true to the original drawings of the children as possible. Even after the professional artist’s rendering of the scale, I continued to give patients the opportunity to create their own scale, by giving them a sheet of paper with six empty circles in a line. They created wonderful, personal scales and proudly displayed them at their bedside and took them home for safekeeping and continued use should they need them. Over the years, various expert reviewers had different ideas about improvement of the scale. Some believing that having all of the faces in a horizontal left-to-right fashion might bias the children in the younger age group. A change in format to a circular style was suggested. We reformatted the scale in a circular fashion for study, but found it was confusing to children so the original left-to-right format was resumed. To see if children could use the scale to distinguish between different pain intensities, I asked children to mark their areas of pain on a human figure drawing and then rate each area using the faces scale. Since many of these children were burned in varying degrees in different parts of their bodies, we knew those areas that were likely to be more painful than others. The children were able to do this task quite accurately. Figure 2) Connie Baker drew this quick sketch of the faces at a child’s bedside to help the child articulate pain using the human figure drawing. Most of the pilot work was done informally with children from preschool through young school age (9-10 years of age). Because teenagers could use any of the adult scales, we invited few adolescent subjects to participate in the early work. It was thought that the idea of using faces to rate pain might seem too juvenile to the adolescents. Since that time, the scale has been used effectively with people of every age above two. Other investigators have used the faces scale with adults, especially the elderly, with successful results. The advantages of the cartoon-type faces scale are that it avoids gender, age, and racial biases. One researcher recently told me that her subjects appreciate having a choice of scales. The overall goal is to improve communication about experienced pain so that it can be effectively managed. As Donna and I began considering the next steps towards research, we had quite a few meetings with Donna’s husband, Dr. Ting Wong, a chemical engineer and master statistician. He loved mathematics and, like Donna, was an excellent teacher. He devoted a great deal of time creating a statistical structure for analyzing our data. As we gathered the data, I tallied it on a yellow legal pad and gave it to Ting to work his statistical genius. The initial series of systematic validity and reliability research of the Wong-Baker FACES® Pain Rating Scale took about two years to complete. In 1983, Donna and I began data collection, later assisted by Lynn Clutter, then a graduate nursing student. Now Dr. Clutter is teaching nursing at the University of Tulsa and Vice President of our foundation board. Ultimately, data was gathered at Hillcrest Medical Center and St. Francis Hospital in Tulsa, as well as the University of California Davis Medical Center in Sacramento, where I later worked as a child life specialist. The FACES Scale was assessed along with an adaptation of the visual analogue scale, and 4 other pain assessment instruments. When the data analysis was completed on the comparison of the six scales, we discovered children in all of the age groups preferred the Faces Rating Scale, even the adolescents! The details and results of that study can be found in the Resources section of the website, in the article Pain in Children: Comparison of Assessment Scales. The primary goal for creating the Wong-Baker FACES® Pain Rating Scale was to help children effectively communicate about their pain so staff and parents could more successfully manage their pain. Initially, the numbers 0-5 were used to quantify the pain, but using the numbers 0-2-4-6-8-10 is easier as it is more consistent with the numeric rating scale of 0-10. The original instructions included a more detailed script. On our website, you will find abbreviated instructions, now recommended and included in the format you may download. Drs. Lynn Clutter, Kristie Nix, and Donna Wong researched the change in instruction wording in 1995. Through the years the Wong-Baker FACES® Pain Rating Scale grew in popularity and use around the world. Dr. Wong’s books, published by Elsevier Inc., were a large reason for the wide-spread use. Donna worked tirelessly to protect the integrity of the scale. Another one of our board members, Dr. Pam DiVito-Thomas, a professor of nursing at Methodist College Unity Point Health, and Dr. Donna Wong spent 5 years on an international and longitudinal study on three continents. That data was collated, but never written up and unfortunately, we believed the data had been lost, until recently when Dr. DiVito-Thomas found it on a flash drive! Expect to learn more about this important research soon. And in 2003, former board member, Dr. Kristie Nix, joined with Dr. Donna Wong to research the use of the pain scale with adults. Sadly, Dr. Donna Wong died in May of 2008, but her work lives on through the Wong-Baker FACES® Pain Rating Scale, her students and mentees, and her lifetime contribution in pediatric nursing including her textbooks and countless articles. You may read more about Donna Wong in the About Us section of our website. Drs. Ting and Donna Wong’s daughter, Dr. Nina Wong Morrissette, an anesthesiologist, wife, and mother of two children, has joined our foundation board. In 2009, I began the Wong-Baker FACES Foundation to continue the work of protecting the integrity of the scale, as well as promoting excellence in pain care. Our scale has a registered copyright and Wong-Baker FACES® is a registered trademark. We have visitors to our site from most of the countries around the world and our scale is translated into over 50 languages and the list is growing. The Wong-Baker FACES® Pain Rating Scale was created with children for children. Donna and I could have never anticipated the wide-reaching use of our scale, now over 30 years later. The scale is supported by years of research and it is continuing to be used in research around the world. We are excited to be offering interviews with experts in pain care and atraumatic care on our new podcast, FACES of Pain Care. We invite you to visit the page and subscribe to FACES of Pain Care. Thank you for your interest in our scale. You may find out more information on our website at www.WongBakerFACES.org. If you would like to contact us, please click on Contact to complete a brief web form. We will get back to you soon.